A new discovery reveals a now public Watch Dogs 3 trademark that could hint at a release specifically targeted for the PlayStation 5 and next Xbox. Thanks to YouTuber 'SkullziTV', a trademark filed back in November has been recently made public and within the filing shows that we probably won't be seeing this game anytime soon or on the current generation of consoles. 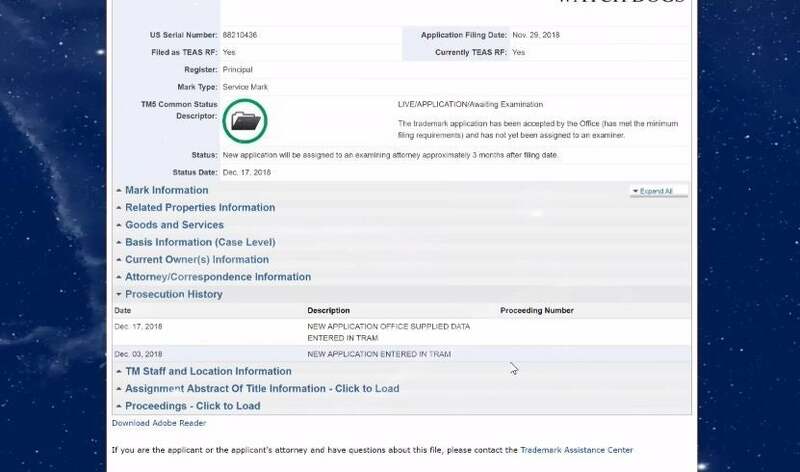 The trademark itself is currently pending and as mentioned in the video above, this trademark - though filed last year - didn't pop up until last week, at least not publically. The YouTuber even shared the current trademarks that Ubisoft has currently, including those still in pending status. What makes this seem like its a hint for next generation is that it's a new filing all together and not connected at all to previous Watch Dogs trademarks. As seen in the video going through Ubisoft's database, the "new application entered in TRAM" was processed on December 3rd of last year with the "supplied data" going through on December 17th. Ubisoft has been pretty quite regarding the future of the Watch Dogs franchises aside from a few cryptic teasers and a smartphone assistant, so we don't actually know much about the title itself. With the first tale being set in Chicago and its follow-up being stationed in a fictionalised version of San Francisco, the popular theory is that the third installment will be taking place in London. Whether Aiden Pearce or Marcus Holloway will be making a grand appearance, or if it will be another new protagonist all together remains to be seen but with Sony sitting out of E3 this year, now is the perfect time for Ubisoft to show gamers what they've got to fill that showcase gap. What do you think about the recent find? Do you think Watch Dogs 3 will be a launch title for the next generation, or do you think it could be even further off? Sound off with your thoughts in the comment section below, or hit me up over on Twitter @DirtyEffinHippy!